Images: @JJWilliamsWON. Check out JJ's Flickr album for more photos from the tapings. 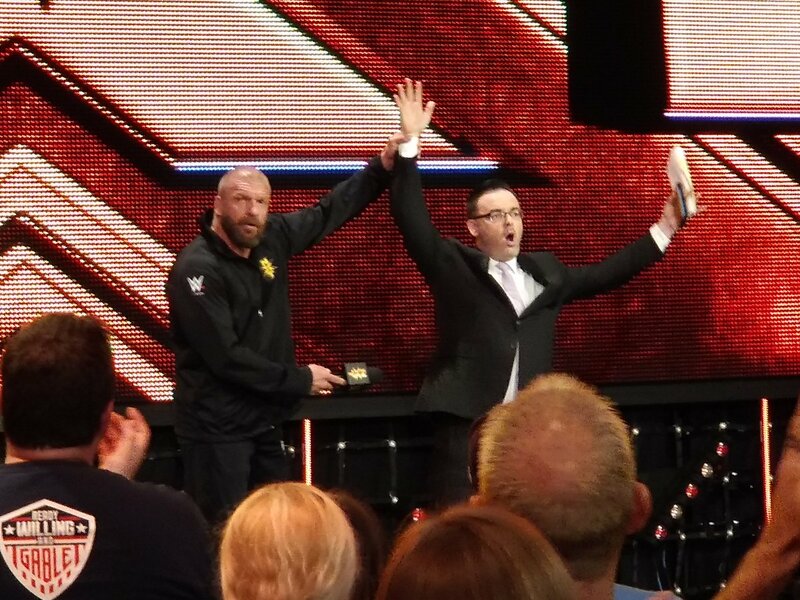 - Triple H introduced Mauro Ranallo as the new commentator before the show. Female referee Jessika worked this match. BelAir (previously Bianca Blair) got a huge reaction instantly for smacking Aliyah with her braided hair. BelAir won with a spear. Velveteen Dream used a flying elbow to get the victory. 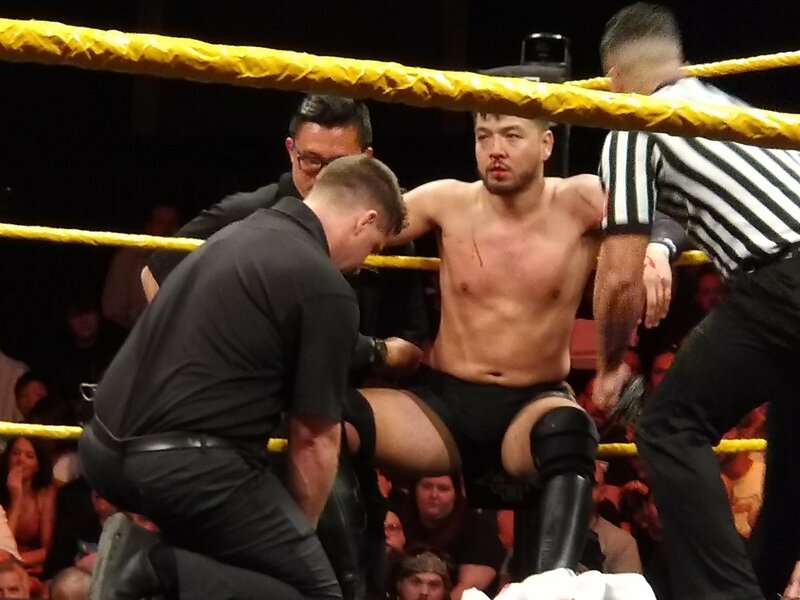 Lorcan ran in to fight and caught Itami with a shot, then the referee backed Lorcan away and we saw that Itami was bleeding. The referee and doctors wiped him down and waved the match off. Bourne was formerly known as Danielle Kamela and Hachey was Jayme Jameson. 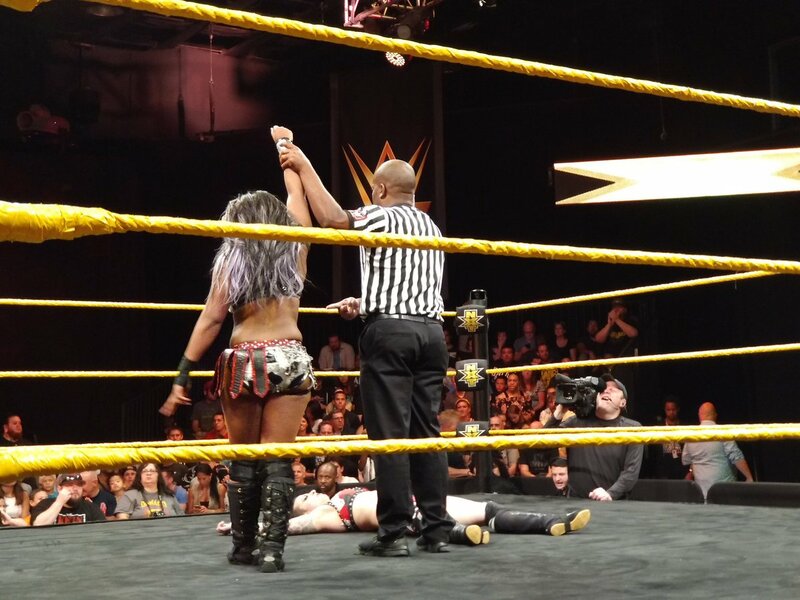 This was a quick match that Bourne won to advance to the Mae Young Classic. 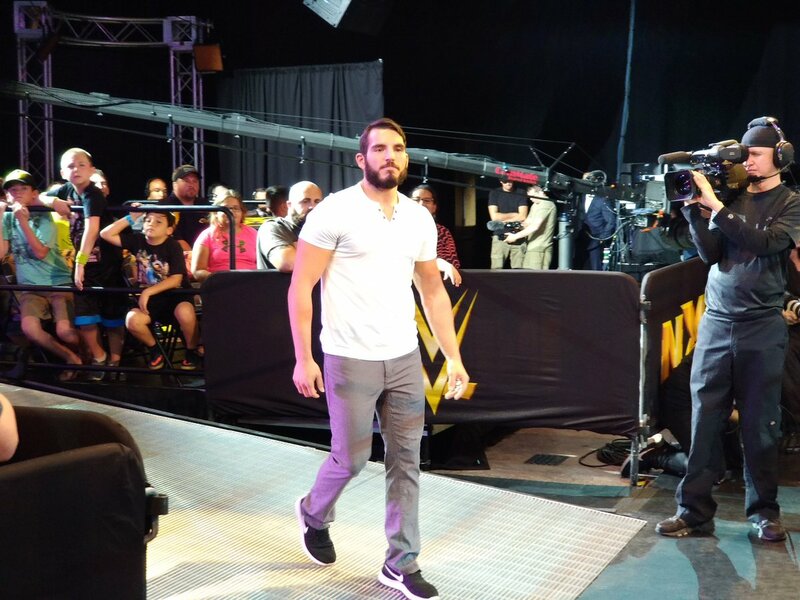 - Johnny Gargano made his return to Full Sail and talked about what Tommaso Ciampa did to him. He said that he's going to get back to wrestling and he has to be at TakeOver: Brooklyn. The match that they were supposed to have earlier got re-taped here. Itami hit a GTS to win one of the best sprints in recent memory. 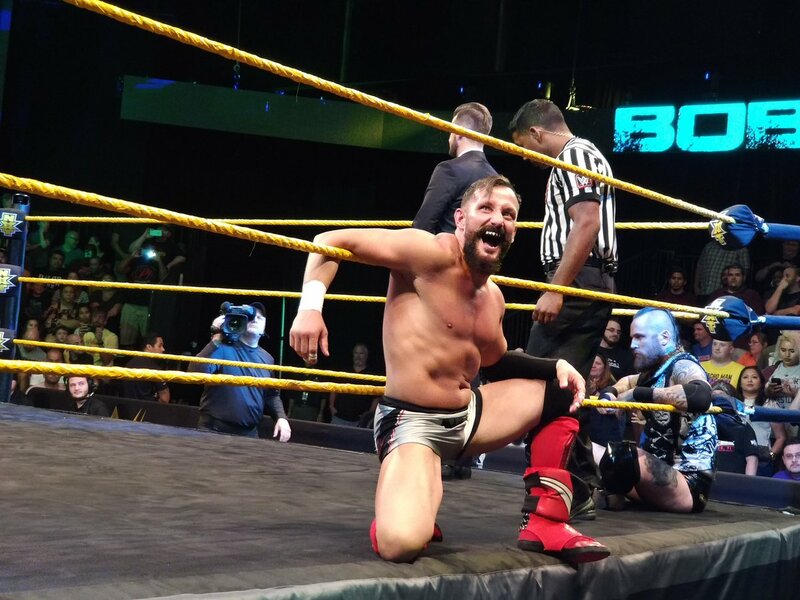 It had great action, then Itami called out Kassius Ohno to talk after the match. Before they could, SAnitY destroyed them both. Jose got the victory with his pop-up knockout punch. Andrade "Cien" Almas and Thea Trinidad showed up at ringside, with Almas jumping Bononi and destroying him. He then pointed down Jose before bailing out of the ring. The crowd was hot for this one, with them doing dueling chants early. Riot hit a top rope rana for a close near fall, but Moon ended up winning with The Eclipse. The crowd was into this one the whole time. SAnitY worked over Itami throughout. The story was that Ohno was out of position for the tag whenever Itami needed him, so Itami seemed weary of him. Dain hit a running crossbody splash on Itami for the finish. Ohno was frustrated as he looked down Itami after the match. They both then made their way to the back. Lorcan submitted Burch with a single-leg crab to win another physical match. Burch wanted a rematch in the future and Lorcan seemed to agree. The crowd was hot for this one as well. Strong had the early advantage, including when they were fighting outside of the ring. Roode ended up cutting him off and started working over the knee viciously. Strong fired up and fought valiantly, even kicking out of the Glorious DDT. Strong hit a double knee backbreaker for the visual pin, but Roode had his foot under the ropes so the match continued. Roode then retained after hitting his DDT in the middle. 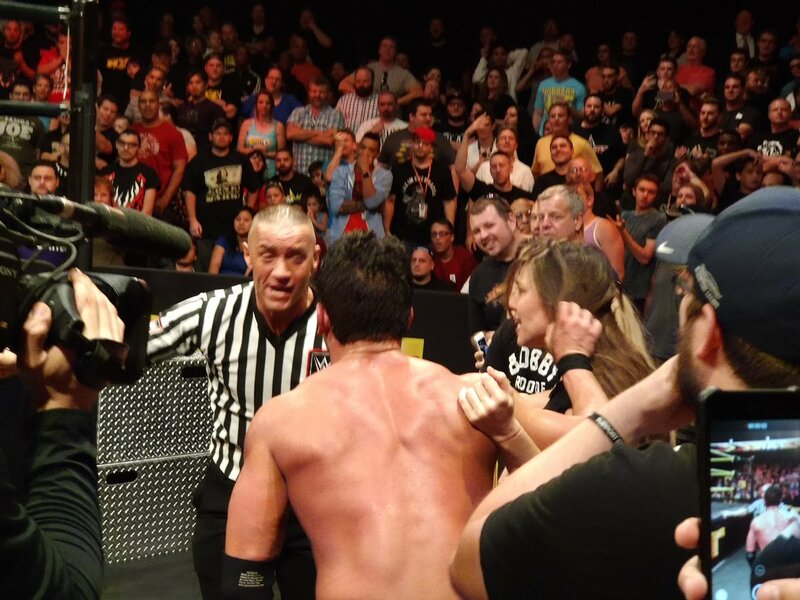 This was a match worthy of a TakeOver main event and it told a great story with Strong's fiancee at ringside. Strong sat in the corner devastated by the loss. 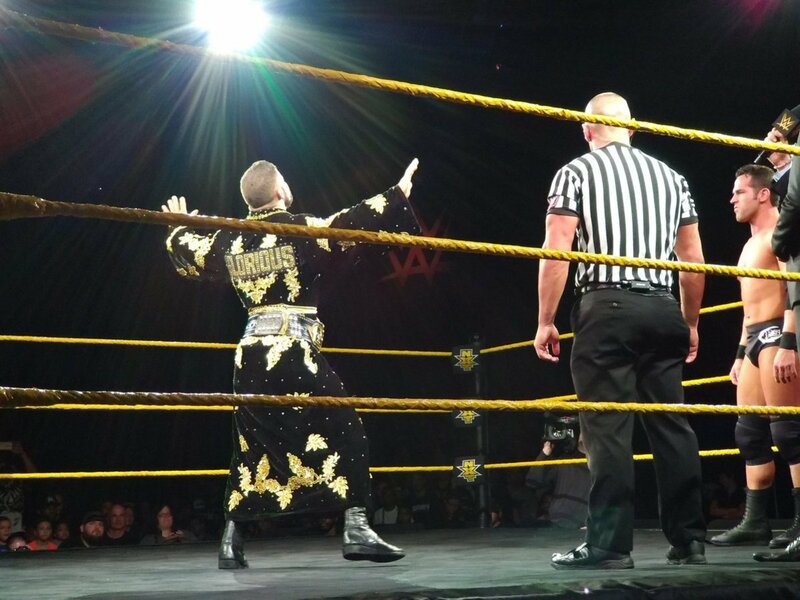 Ring announcer Mike Rome announced Fish as making his NXT debut and he received a full entrance. The crowd was quiet early and were unsure how to react until Black hit Black Mass for the victory. As expected, they had a physical match. 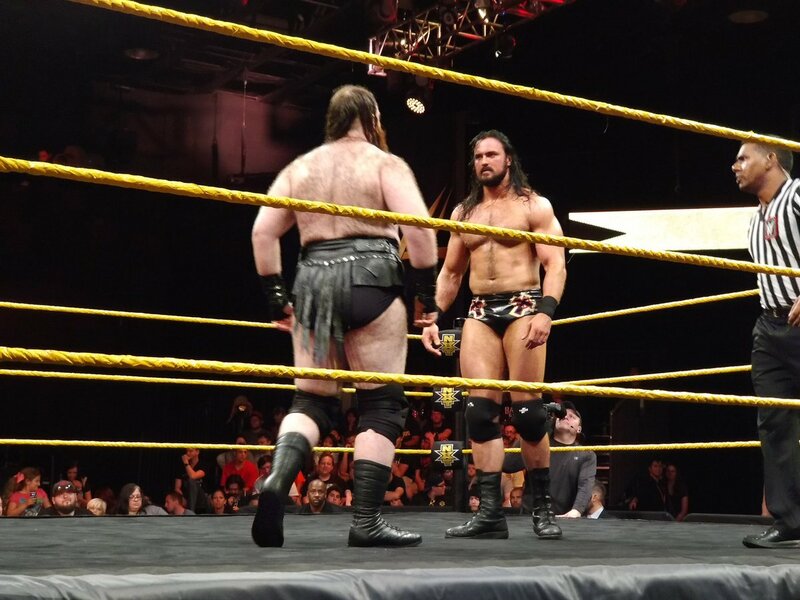 The audience was behind Heavy Machinery with a "Steaks and Weights" chant, but the champions retained with their double team stand-up lariat. SAnitY's music hit after the match and they made their way to the ramp and had a staredown with AoP. Rama won this one very quickly. Dain had the advantage early. He wore his opponent down until McIntyre fired up and hit the Claymore Kick to win. He will now face Roode for the title in Brooklyn. 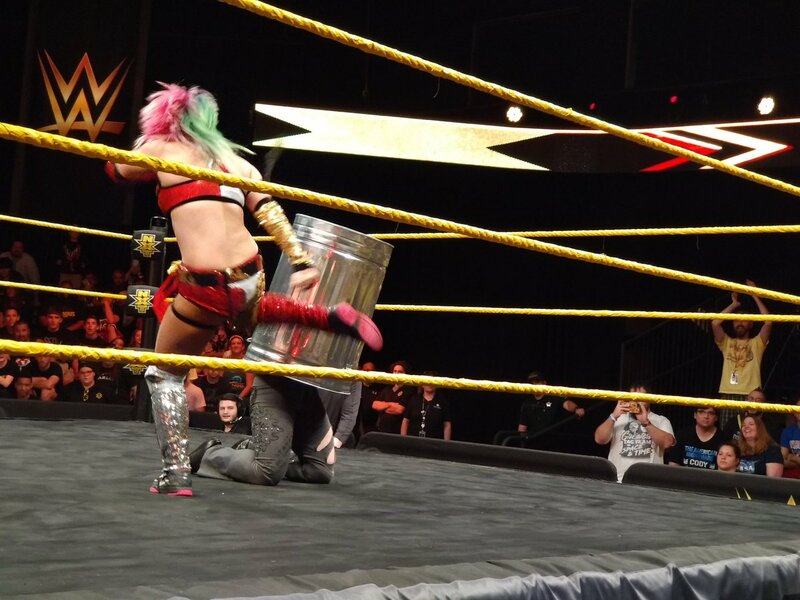 This had all types of brutality, with suplexes on chairs, Asuka putting Cross in a trash can and kicking it in, and more. Cross hit Asuka with repeated swinging neckbreakers, though they both kept making the ten count and continuing. Asuka hit four German suplexes in a row and a spin kick, but Cross kept getting up. The brawl went out of the ringside area and made its way to the production and commentary side. Asuka suplexed Cross off of a ladder and through the commentary table. The champion made the 10 count and retained her title.